I hope you received good news on results day and are looking forward to your next step! If you didn’t get the news you were hoping for, you may have had to change your original plan. This is something I’ve experienced – my journey to Warwick wasn’t conventional and I had to take a different route from what I had originally planned. It’s a stressful and confusing time but adapting your plans can often lead you somewhere better than you could have imagined, and I wanted to share my experience of this. When I finished my A Levels, I accepted an offer from a different uni and deferred my place for a year due to medical reasons. During that year I studied a one year course at college and then went to take up the university place that I’d deferred. I had a great time there and met amazing people but realised it wasn’t the right course for me so withdrew during the first term. This was a big shock and felt like a massive setback – suddenly the plan I’d had for two years hadn’t worked out. It was really scary to go through a period of uncertainty and I felt a lot of confusion and self-doubt, but I knew that the right course was out there so spent the year researching, visiting and applying to different universities. I also worked, volunteered with a local charity and performed with a theatre group so got to do lots of exciting things that I wouldn’t have otherwise had the opportunity to do! When I visited Warwick and went for my interview day, I knew it was the place I was meant to be and couldn’t believe it when I was offered a place. 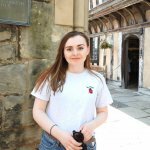 Staying at college for a third year had meant I was able to boost my grades and having an unexpected year out meant I’d learnt lots of new skills, met new people, gained valuable experience and proved to myself that I could overcome setbacks. Although it took some time to regain my sense of direction and confidence (as well as a lot of hard work and stress! ), everything worked out better than I could have hoped, and I now study the course that is right for me at a university I love. I wanted to share this experience because although you might be feeling lost now, life takes you to unexpected places. Sometimes things don’t go to plan but that’s okay – you’re strong enough to get through it. Give yourself time to figure out an alternative route to where you want to go and you will make it happen! You’ll probably find that the new route you take will bring you unexpected experiences, knowledge and friendships which will only make you stronger and more prepared for the amazing opportunities waiting for you.